Aberrant methylation of regulation regions of tumor-suppressor genes (TSGs) is shown for many cancer diseases. In course of this modification the enzyme DNMT3 methylates RCGY sites in CpG-islands of regulation regions producing R(5mC)GY sites. Earlier we developed GLAD-PCR assay to determine R(5mC)GY site in a definite position of human genome . In this work we have applied GLAD-PCR assay to determine R(5mC)GY sites in regulation regions of ESR1 and ELMO1 TSGs. We have studied methylation of DNA fragment in first exon of ELMO1 gene and in ESR1 promoter region in DNA preparations from malignant cell line SW837 and colorectal tumor samples. We have determined methylation of four sites in each region and found two highly methylated sites: GCGC in first exon of ELMO1 gene and GCGT in promoter region of ESR1 gene. 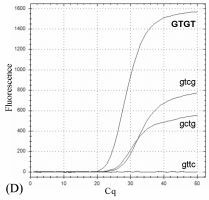 Site GCGT is weakly methylated in healthy tissues and more methylated in the most of colorectal samples. Site GCGC is not methylated in healthy tissues and significantly methylated in 60% of colorectal samples. A possibility to use GLAD-PCR assay for cancer diagnostics is discussed. DNA methylation plays an important role in carcinogenesis. It is well known that de novo methylation of regulatory regions of several TSGs occurs at early stages of carcinogenesis and blocks these genes expression, whereas in healthy tissues the promoter and first exon regions are unmethylated and the genes are active . This abnormal (aberrant) methylation was shown for many TSGs in cancer diseases [2, 6], however these genes are varied in different cancer tissues . In particular, an aberrant methylation of more than 50 genes was shown in case of colorectal cancer [8, 9, 12]. In mammalian genomes de novo DNA methylation, including an aberrant methylation, is catalyzed by DNA methyltransferases DNMT3a and DNMT3b, which recognize 5’-RCGY-3’ and modify the inner CG-dinucleotide with formation of 5’-R(5mC)GY-3’ sequence (where R = A or G, Y = T or C, 5mC – 5-methylcytosine) in both DNA strands . DNMT1 maintains a new DNA methylation pattern after replication. Recently discovered a new methyl-directed site-specific DNA endonuclease (MD DNA endonuclease) GlaI recognizes and cleaves (as indicated by arrow) exactly the same site 5’-R(5mC)^GY-3’ . Thus, GlaI is a convenient tool to detect 5’-R(5mC)GY-3’ sites in human and mammalian DNA. Earlier we developed GLAD-PCR assay which allows to use GlaI for determination of R(5mC)GY in a definite position of human genome even in a presence of excess of DNA molecules, where this site is unmethylated . The aim of this work is to apply GLAD-PCR assay for determination of aberrant methylation in regulatory regions of ELMO1 and ESR1 TSGs in DNA preparations from tumor tissue in colorectal cancer. The source of DNA for this study was DNA extracted from tumor and healthy tissues of colorectal cancer patients. In all cases of malignant neoplasms, the diagnosis was confirmed morphologically (adenocarcinoma varying degrees of differentiation). The distribution of patients depending on the stage of the disease was as follows: 2 patients (patients 1 and 76) had stage I disease (T1N0M0), 3 patients (numbers 16, 20 and 37) – stage II (T2N0M0), 6 patients (patients 2, 19, 31, 50, 54 and 56) – stage III (T1-4N1-2M0) and 4 patients were diagnosed with generalized colorectal cancer (presence of distant metastases (M1 in all embodiments, the size of the tumor (T) and the presence or absence of metastatic regional lymph nodes (N)) ( patient number 25, 51, 59 and 75). The informed consent was obtained from all donors of biological material for participation in the study. Tumors tissue samples (n=15) received at the surgery was placed in a tube containing a solution of RNA-later and stored during 24 hours in the refrigerator at +4°C, then transferred to freezer and stored at -20°C. The samples of healthy tissue of the colon (n=5), taken at a considerable distance from cancer at resection line were used as control samples. Preservation and storage procedure applied for samples of healthy tissue was similar to that described in relation to tumor tissue. DNA extraction. Extraction and purification of DNA from tumor and healthy tissues and DNA cells lines of the colon adenocarcinoma of human SW837 for used to identify promising GLAD-PCR assay sites R(5mC)GY, was performed by phenol-chloroform extraction . where g is the genomic primer; z – TaqMan probe; h1, h2, h3, h4 – hybrid primers. Analysis of the data and their statistical processing was carried out using the software package "Bio-Rad CFX Manager V. 2.1". Studied DNA fragments. Figure 1 shows the coordinates of the regulatory regions of genes ELMO1 and ESR1 selected for the study. A fragment of the CpG island in the region of the first exon with a length of 154 nucleotide was studied in the case of the ELMO1, whereas in the ESR1 gene, we determined the methylation sites RCGY in the area of CpG island of 183 nucleotides in the promoter region. As shown in the figure, the studied fragments contain 4 site RCGY that can be modified in the case of aberrant methylation and then cleaved by GlaI MD DNA endonuclease. Fig 1. Determination of R(5mC)GY sites in SW837 cell line DNA. (A) - a fragment of the nucleotide sequence of the gene regulatory region ELMO1. Showing RCGY sites, genome primer, the probe and the 3'-end tetranucleotide in hybrid primers binding sites. 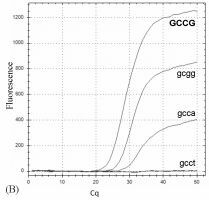 (B) - accumulation curves of fluorescence during the PCR in real time using all variants of hybrid primers. Capital letters "GCCG" show 3'-end tetranucleotide in hybrid primer corresponding to the point of DNA hydrolysis for most methylated site; (C) and (D) - the same data for the ESR1 gene. The numbers before and after the nucleotide sequence - coordinates in the human genome GRCh38.p2 from the GenBank database. Selection of promising R(5mC)GY sites for GLAD-PCR assay. GLAD-PCR assay of R(5mC)GY sites is carried out in three stages. First, GlaI cleaves DNA in the middle of all R(5mC)GY sites with formation of blunt ends. Then the unique universal adapter is ligated to all fragments. Finally RT PCR with TaqMan probe is performed. One genome primer is designed for DNA region of interest, structure of another hybrid primer is based on an adapter sequence. As a result in the presence of a huge number of different fragments obtained after hydrolysis and subsequent ligation, PCR mostly amplifies fragment, which is located near the studied R(5mC)GY site. Usage of the TaqMan probe, which also has a unique structure, even more increases the specificity of the reaction. During the first stage of the work most frequently methylated R(5mC)GY sites within selected fragments of regulatory regions of TSG were chosen for further GLAD-PCR assay of clinical samples. Preparation of DNA from SW837 cell line was used on this stage. The corresponding hybrid primer was used for each of the eight candidate RCGY sites, found in the studied fragments of the regulatory regions of genes ELMO1 and ESR1. The structure of the hybrid primer for each experiment is listed in Methods. Hybrid primer is a DNA sequence 5'-CCTGCTCTTTCATCGGYNN-3 'wherein 5’-end of 15-dinucleotide primer corresponds with universal adapter and tetranucleotide part at the 3'-end (underlined) is complementary to the genomic sequence at DNA hydrolysis point by MD-DNA endonuclease GlaI. This structure implies the existence of 32 variants of hybrid primers corresponding to different possible terminal sequences after hydrolysis by GlaI of all possible variants of NNR(5mC)^GY sequence. Figure 1 shows the results of GLAD-PCR assay of eight R(5mC)GY sites in the studied regulatory regions of ELMO1 and ESR1 genes. As shown on the figure, in both cases GLAD-PCR assay shows three methylated RCGY sites, located sequentially next to the TaqMan probe. At the same time, however, for both genes the highest frequency of methylation observed in the third in a row site after the TaqMan probe (on the Figure its 3’-end tetranucleotide sequence is shown in capital letters). Thus, in the further work we performed GLAD-PCR assay of the GCGC site in position 37448622 on the seventh chromosome (the first exon of the ELMO1 gene) and GCGT site at position 151807784 on the sixth chromosome (promoter of the ESR1 gene). GLAD-PCR assay of sites methylation in DNA preparations from tissue samples. In this study we investigated DNA from tumors samples of surgical material of (n=15) and normal intestinal mucosa (n=5) of patients with colorectal cancer. GLAD-PCR assay of the two detected sites GCGC and GCGT in the regulatory regions of ESR1 and ELMO1 genes, respectively, were performed using DNA preparations from tissue samples, extracted and purified as described in Methods. GLAD-PCR assay of two selected sites was performed three times for each DNA sample containing 103 copies of the ELMO1 or ESR1 gene. Table 1 presents the results of GLAD-PCR assay: averages of the number of amplification cycles (Cq) (including standard deviation). The obtained data are presented in Figure 2 in chart form. Table 1. The number of amplification cycles (Cq) indicating the standard deviations obtained from the GLAD-PCR analysis of DNA from tissue samples. Fig 2. Cq values for studied tissue DNA samples. On the horizontal axis - the sample number (health tissues showed in blue, tumor tissues – in yellow), the vertical axis - average Cq of three experiments performed for each sample, indicating the spread of data. The dotted lines represent the minimum Cq, obtained for healthy tissues. As it presented in the table in case of GCGT site in the promoter of ESR1 gene Cq value for the four DNA preparations from healthy tissues varies from 25.75 to 26.76, and for one sample the value is 31,53. Thus, this site is poorly methylated in four samples of healthy tissue and completely unmethylated in the sample 56T. As shown in figure 2, in DNA preparations from tumor tissue, the value of Cq is less than in healthy tissues. Thus, in most of the studied tissue samples GCGT site in promoter of the ESR1 gene is higher methylated in the tumor tissues than in healthy. Only in one sample of healthy tissue this site is almost unmethylated. Presented in figure 2, data on the results of GLAD-PCR assay of GCGC site in the first exon of the ELMO1 gene show that for healthy tissue obtained Cq values are close to 30 or greater than this value, that means the absence of methylation of this site. Similar Cq values were obtained for six samples in tumor tissues 1T, 2T, 19T, 20T, 25T and 50T. At the same time for the other nine tumor tissues the value of Cq varies from 23,14 up to 27,21, which means considerable methylation frequency of the studied site GCGC in the DNA preparations. As can be seen from Fig.2 simultaneous significant methylation of these sites in both genes take place in tumor tissues of six samples under the numbers 16, 37, 54, 59, 75 and 76. Significant methylation of one of these genes was observed in six samples of tumor tissue under the numbers 1, 2, 31, 50, 51, 56. These 12 samples represent all four stages of the disease, which corresponds to the literary data on the methylation status of regulatory regions of oncosuppressor genes during the development of the tumor [2, 6]. Prospects of application of GLAD-PCR assay for diagnostics. The results show that the GLAD-PCR assay allows to identify the R(5mC)GY sites related with aberrant methylation of regulatory regions of oncosuppressor genes in tumor tissues and cell line SW837. The GCGT site in the ESR1 gene promoter is poorly methylated in healthy tissues, but in most tumor tissues there is an increase of frequency of its methylation. The GCGC site in the first exon of the ELMO1 gene is unmethylated in healthy tissues and methylated in 60% of tumor tissues samples. Currently, there are methods of determining aberrant methylated extracellular DNA in blood of patients based on bisulfite conversion of DNA [10, 14]. However, these techniques are time consuming and often produce erroneous results, therefore, they are practically not used in usual clinical practice. GLAD-PCR assay allows to detect the extracellular aberrant methylated DNA using much more simple and reliable method consisting just in the sequential treatment of DNA with two enzymes and for subsequent real-time PCR. In the future we plan to continue working with tissue samples to identify sites of aberrant methylation, suitable for GLAD-PCR assay, in regulatory regions of other oncosuppressor genes. From the list of examined sites will be selected those which methylation is observed in the greatest number of samples of tumor tissue in the absence of their methylation in healthy tissues. After formation of a panel of such sites, we will continue testing GLAD-PCR assay on preparations of extracellular DNA from the blood of patients with the aim of developing a relatively simple and affordable method of laboratory diagnostics of colorectal cancer. According to the results of this study, the application for patent "Method for determining the methylation sites PuCGPy regulatory regions of genes-markers of colorectal cancer by a method of GLAD-PCR assay and oligonucleotide primers and fluorescently-labeled probes for the implementation of said method" was made, the priority date is 16.07.15, # 2015129314. Abdurashitov M. A., Chernukhin V. A., Tomilov V. N. etc. Restriction analysis of human DNA – new possibilities in DNA diagnostics // Med. genetics. -2007. –T. 6. –S. 29-36. Kiseleva N. P., And Liechtenstein.In. Epigenetic changes in tumor cells. The role of DNA methylation in carcinogenesis // Carcinogenesis / ed. by D. G. Zaridze. –M. : Medicine, 2004. –S. 191-203. Kuznetsov VV, Akishev AG, Abdurashitov M. A., Degtyarev S. Kh. a Method of determining nucleotide sequence PU(5mC)GPy in a predetermined position of the continuous DNA // Patent RF № 2525710. Smith K., Klco S., Kantor H Pulse electrophoresis and methods of work with large molecules // Genome analysis. Methods / ed. by K. Davis. –M. : Mir, 1990. –S. 58-94. Caiazza F., Ryan E.J., Doherty G. et al. Estrogen receptors and their implications in colorectal carcinogenesis // Front. Oncol. –2015. –Vol. 5:19.
de Caseres I.I., Cairus P. Methylated DNA sequences for early cancer detection, molecular classification and chemotherapy response prediction // Clin. Transl. Oncol. –2007. –Vol. 9. –P. 429-437. Handa V., Jeltsch A. Profound flanking sequence preference of Dnmt3a and Dnmt3b mammalian DNA methyltransferases shape the human epigenome // J. Mol. Biol. –2005. –Vol. 348. –P. 1103-1112. Kibriya M.G., Raza M., Jasmine F. et al. A genome-wide DNA methylation study in colorectal carcinoma // BMC Med. Genomics. –2011. –Vol. 4:50. LaPointe L.C., Pedersen S.K., Dunne R. et al. Discovery and validation of molecular biomarkers for colorectal adenomas and cancer with application to blood testing // PLoS One. –2012. –Vol. 7:e29059. Lao V.V., Grady W.M. Epigenetics and colorectal cancer // Nat. Rev. Gastroenterol. Hepatol. –2011. –V. 8. –P. 686-700. Mishra D.K., Chen Z., Wu Y. et al. Global methylation pattern of genes in androgen-sensitive and androgen-independent prostate cancer cells // Mol. Cancer Ther. –2010. –Vol. 9. –P. 33-45. Mitchell S.M., Ross J.P., Drew H.R. et al. A panel of genes methylated with high frequency in colorectal cancer // BMC Cancer. –2014. –Vol. 14:54. Tarasova G.V., Nayakshina T.N., Degtyarev S.Kh. Substrate specificity of new methyl-directed DNA endonuclease GlaI // BMC Mol. Biol. –2008. –Vol. 9:7. Umer M., Herceg Z. Deciphering the epigenetic code: an overview of DNA methylation analysis methods // Antioxid Redox Signal. –2013. – Vol. 18. –P. 1972-1986. Yagi K., Akagi K., Hayashi H. et al. Three DNA methylation epigenotypes in human colorectal cancer // Clin. Cancer Res. –2010. –Vol. 16. –P. 21-33.